Before tiny electronic lighting controls and predictable fade times, the theatre world relied on the physicality of men in coats pulling levers, twiddling dials and a direct connection between them and the light seen on stage. The reason that early modern lighting consoles looked suspiciously like they were based on a pipe organ, was that the real time connection of an lighting technician and his lights was highly regarded. Along came the predictability of electronic systems and the growth of the international lighting designer, and lighting in the mainstream theatre became a “set and forget” gig. LXQ2 Go just as x moves to y, 3 seconds with a 1 second follow on, DSC special at 33.3%. The Director and Lighting Designer wanted to know that the vision they had worked so hard to create would not be messed up by mere operators. Many theatre shows today still run under such factory default conditions, it manages the risk of unpredictability. As concert lighting has grown up and commercial lighting for all kinds of live events has become a job for many, the old direct connection between an LD and his illuminating proteges has returned. The time and planning restrictions on many shows (particularly one offs) has meant that creating lighting “live” is even more the fashion. This is great, not because running a show with no rehearsal and a similar quantity of information is apparently cheaper, but because stage lighting is an art that shouldn’t stop just because the punters are in. I enjoy playing music and was trained read the dots at an early age. But there was a recurring theme in my young musical career that was a clue to my future love of lighting shows live. “Robin, that sounded nice but half of what you played isn’t on the page and you stopped looking at the music after the first eight bars”. Apparently, “making it up” is not main part of the traditional musical education so passing grade examinations took a back seat while I got interested in improvised music such as jazz. We are taught that it is better to have live musicians in the pit (and not just by the landlord of the pub next door), live dancers, live actors and a sound mix that is presided over by a real human. Well, a sound engineer anyway. Keep it live, they say! So why is so much stage lighting taken from the artist and given to the lighting equivalent of a backing track? A simple enough question and one that is often asked of a Lighting Designer by Directors, Producers and other associated bill payers. What lighting have you got for us today? Just give us an idea, y’know, whistle a few bars or whatever. This question seemed inappropriate for a live show that was about to happen, we had never done the show before and would never do it again. Now, I am not an overly sensitive artistic type, but it struck me that you don’t wander up to the Courtney Pine and casually wonder what notes he might be using today. I don’t suppose many people asked Monet for a peek in his paintbox, to see what colours he had mixed up. The innocent question received the usual pushing up of faders, lighting the backdrop and cheery chat about what kind of show it might be tonight But it started me thinking about my favourite approach to lighting and the parallel with live artists such as those playing improvised music. Lighting is a creative outlet and doing it live can build an interaction between performers of a show both on stage and those of us in the dark. As a jobbing lampie, a lot of events can sometimes seem mundane – light the stage, change the colour, look out here comes a big flashy bit. It is surely a lot less mundane that pressing Go at exactly the same time 3 times a day when someone else tells you to. Perhaps the reason I was drawn to events over theatre was the same reason I never really got interested in sight reading music – it seemed like the difference between a riffing comedian on song and a TV presenter grimly plugging away at the autocue. Live show lighting moves a large chunk of the creative process from the pre show and technical period of a production and drops it slap bang in the middle of the show itself. Modern lighting equipment and control systems allow for even more interactivity than levers and a bit of wood ever did, so why not use all that power? We’re not talking about taking your own cues and firing off pre recorded looks but actually deciding on, balancing and changing the lighting right here, right now. The trouble with leaving the design process so late, is that other people don’t like it. “What’ve you got for us today, then?” “Er, well I’ve mixed up my paints, cleaned my brushes and when we get going you can have a look.” It’s too risky. If you work backstage, you don’t need the attention of a crowd or applause for your performance – hell, you probably don’t feel the need to earn much money! The job satisfaction of being part of a show is your own personal, real time input to the moment, not just pressing a button like Pavlov’s dog in show blacks. So take a break from thinking in Cue Lists and start thinking of yourself as a “stage lighting performer”. 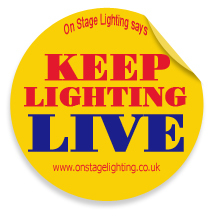 Join the campaign around the slogan Keep Lighting Live! Take to the streets and burn your show disks. Do you enjoy lighting shows live? On Stage Lighting has a few articles lined up on the basics of creating live lighting including rig design and use of the lighting console as a paintbox. Let us know your thoughts in the comments as usual. Update:// Hat tip to OSL reader Carlos who reminded me of work by Nick Hunt. Nick wrote a paper in 2001 it’s well worth the short read. Image with apologies to the Musicians Union. Perhaps it’s not just true in the live events sector. Some of my recent theatre designs have been for shows that are very free in style, with plenty of improvisation. These shows have a delicate emotional rhythm for the audience, which can change nightly. So half the cue lists have ended up saying “when it feels right, go.” The best operators understand this and end up helping the piece flow; other operators (often those just out of technical college) are too busy watching for x to move to y and don’t ‘feel’ the piece. Certainly, an element of freedom is necessary in some situations. Blindly designing using a regimented “stand-by/go” cueing system could be detrimental not just to music and live events, but any lighting design. Apologies for the wankey language. You were kind enough to link to my paper from Showlight 2001, so I thought I would fill in a little background. My work in this area is all to do with my PhD thesis, which is nearing completion (planned for submission around Christmas/New Year). The Showlight paper was a very early essay on my thinking, right at the start of my research process. My research is centred on the notion of the lighting artist as performer rather than designer, so deferring some creative decisions to the moment of performance in exactly the way you describe in your article. Because I am doing this in a theatre context, part of my proposal is that lighting is an integral part of rehearsal, so for the performance I created last August, we had lighting in the rehearsal room from from day one, so that the actors, director and myself could work with light throughout. I built my own lighting control system to test out various ideas I had for performing theatre lighting live, very much influenced by Fred Bentham’s 1935 Light Console and his ideas on ‘playability’. It’s good to see someone advocating a return to live human input. I returned to lighting, mainly rock, a few years ago having been active in the late sixties (mainly rock) and seventies (mainly dance and CCTV studio). I was sad to see the level of automation and programming in common use. (Although in the sixties we’d have given our eye teeth for some of the features and capabilities now available on pretty basic control desks). Every performance is unique, be it theatre, show, dance, rock, other music, etc. Audience, performers’ mood, atmosphere etc all play a part. Who would want to go on stage and deliver exactly the same performance time after time. The bottom line is there are people onstage putting their hearts and souls into it, don’t they deserve the same from lighting, with empathy, spontaneity and similar terms coming into play. It requires a massive commitment of faith by the performers and some shows will be much better than others, but the average is likely to be higher with more mood. For me, a decent manual desk is an instrument to play along with the band. I prefer to use my old wet liquid lightshow as a main feature and that is totally unprogrammable and pretty unpredictable in terms of the final projection. You can affect colour, pace and mood, after that the ‘chemistry’ takes over. I’d love to hear more from Nick on his system which sounds like a light organ, something we dreamed of in ’68! Thanks for your thoughts, Pat. I am hoping to catch up with Nick and hope to find out more about his work in this area. Will post details if I get any. Nick, if you having to busk a festival of drama groups and have no idea what they are going to do, I would suggest some catch all colour washes, warm, cold, deep blue (for night scenes etc) and possibly an intense red if you think it might suit some scenes. Also, it’s an idea to make the colour washes pretty distinct so that the different scenes are obvious to the audience. Specials, a Down Centre or Centre is a must, possibly top light for a bit of dramatic effect. You can try to get some wide beamed Down Left and Down Right specials in case there is some offset blocking, where the main focus stands to one side while others look across stage. Squeeze a generic breakup gobo wash into all that and you can busk whatever is thrown at you. I work on the concert lighting industry i enjoy lighting shows live, and I also enjoy the opportunity to spend time crafting a show, however the choice of which method to use for a particular show is dictated by circumstance. Our job is to provide the best possible show for our client, and method for this is very much time dependent. With little or no programming time, then running a show on the fly makes sense, however if preprogramming is possible then creating appropriate looks for particular moments is always going to result in a better looking show. This doesn’t mean there is a complete lack of live interaction, the operator still needs to connected to the moment feel the cues. There will always be stabs and highlights that are better actioned outside of a main cuelist, and even that main cuelist can be renavigated should the onstage artist go off-piste. But surely the choice of how we approach a show is decided by the situation rather than our personal desires.